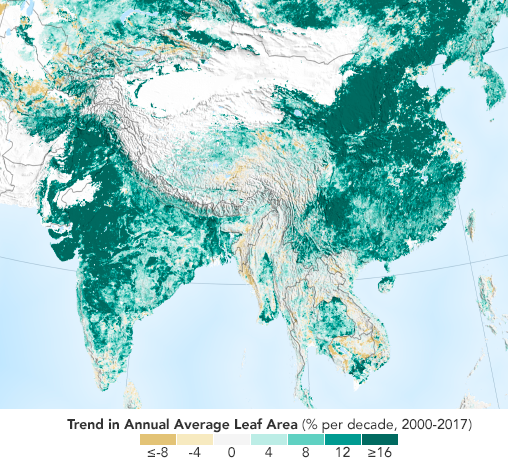 Satellite images provided by the US National Aeronautics and Space Administration (NASA) show that greenery in Pakistan has been growing at double digit rates over the last few decades. All of this rapid greening of the country is the result of intensive agriculture in Punjab and Sindh provinces. The Boston University research team found that "global green leaf area has increased by 5 percent since the early 2000s, an area equivalent to all of the Amazon rainforests. At least 25 percent of that gain came in China. Overall, one-third of Earth’s vegetated lands are greening, while 5 percent are growing browner. The study was published on February 11, 2019, in the journal Nature Sustainability", according to NASA Earth Observatory. Pakistan's arable land grew by about 600,000 hectares between 2014 and 2016, according to Food and Agriculture Organization (FAO). It increased from 36,252,000 hectares to 36,844,000 hectares. However, Pakistan has experienced deforestation in this period. The area under forests has shrunk from 1,515,000 hectares in 2014 to 1.429,000 hectares in 2016.